The battle of Ligny is part of the Hundred Day Campaign and is one of the final engagements for Napoleon Bonaparte and his French army. Having arrived back in Paris, Napoleon is declared an outlaw by the Congress of Vienna and the Seventh Coalition is mobilized against France. Seizing the initiative Napoleon strikes north into Belgium to attack the British before the forces of the coalition can come together. Napoleon splits his force into three a left wing commanded by Marshal Ney, a right wing commanded by Marshal Grouchy and the Reserve commanded by Napoleon himself. Rapidly overrunning the outposts of the coalition Napoleon positioned himself in the central ground between the British and the Prussians. 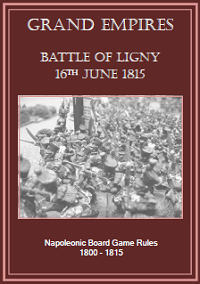 Ney attacked the British in an attempt to secure the crossroads at Quatre Bras and Grouchy attacked the Prussians at Ligny. The battle starts at 2 O’clock in the afternoon; can you change history and defeat the French? Each side will have a number of battle counters that represent the units that are present at the battle. These counters are designed to have two sides, a formed and disrupted side. Command and garrison counters are also provided for the game. 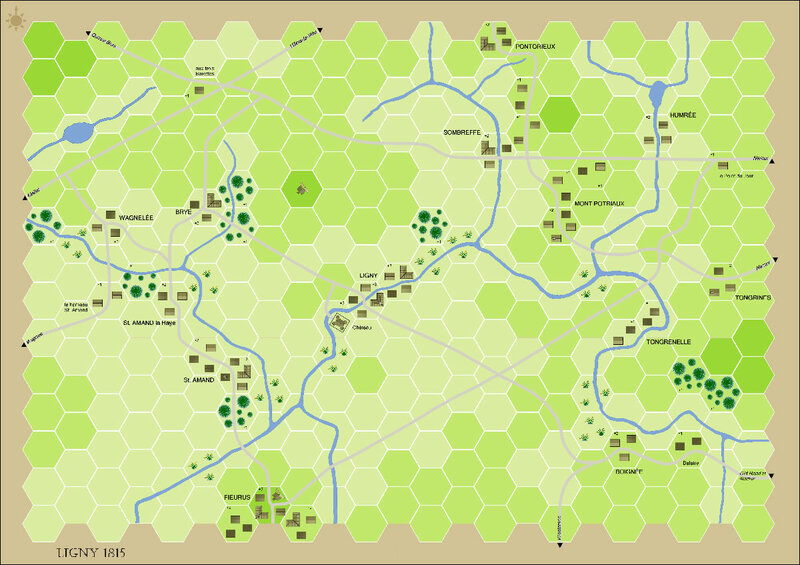 The Allied and French forces alternative phases within the bound sequence, this ensures that no one gets an outright advantage at any point with the game. Counters will either move, fire or mêlée within the bound sequence. Counters can rally if they become disrupted from fire or mêlée, but this is dependent on the morale value of the counter. D6 dice are used throughout the game for firing, mêlée and morale tests. The mechanics are simple, total up the fire or combat values of your counters that are attacking an opposing counter and roll this amount of dice against it. A straight six is required, the more the better, rolled sixes relate to damaging hits. The receiving counter must execute a morale test against these hits or it will become disrupted or it could even be dispersed. The French have fourteen bounds in which to cross the bridges and deal a decisive blow to the Prussian army. Along the way they can capture up to six objectives, holding these will aid their final victory conditions. The Prussians have to hold out against the French until the end of the day when they will retire back towards Waterloo. 2D or not 2D that is the question? The game board can be printed straight to card; we prefer A4 self-adhesive labels that can be applied to a thinker stronger basing material. This will give a good 2D board to be played on straight away. But with a little time and effort the game board can be contoured to produce a fantastic looking 3D game board. 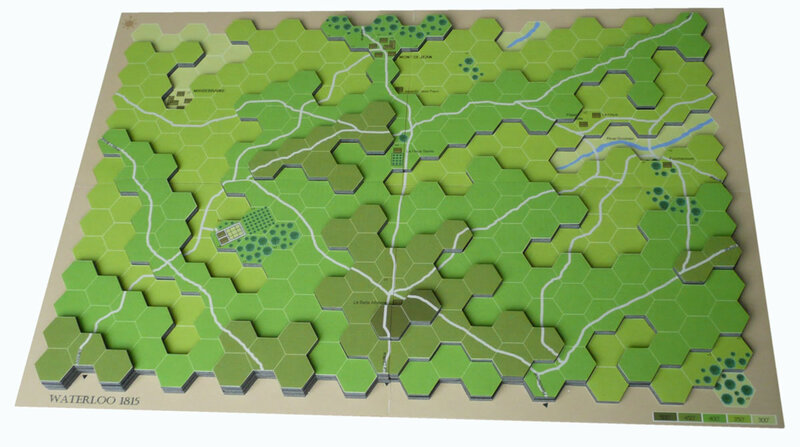 See our website for building 3D gaming boards, use the demo link on this site. Appling two printed sheets of counters to the opposite sides of a sturdy piece of card will quickly give you the double sided counters for the game. It’s that simple.